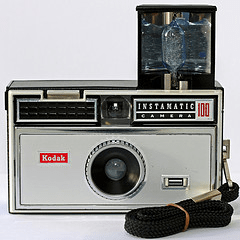 When I was a child, there was very little extra money and although we had a camera similar to the one in the photo, we often didn’t have film on hand or money to process the pictures that were taken. As I grew up, I found that I had a very poor memory of my childhood. There were (and still are) countless times when we are engaged in conversation about the past and I literally have no recollection of the event. I really don’t know why this is or if perhaps it is even normal, but I have always felt that my long-term memory was not as good as my peers. As a young adult, my parents moved from our family home in the “country” to the city. Of course this meant doing a lot of sorting and purging. My mom was by know means a hoarder, but we always had one room that was stacked with boxes of “stuff”. We lived in a heritage home and the basement was not suitable for storage and so for us, one of the bedrooms became the “dumping” ground. I hated that room and perhaps that is what shaped me into the organized person that I am today. Sometimes, I think we grow-up reflecting on our parents and upbringing and making specific decisions about how we are going to do certain things different or “better”. Such was the case for me when it came to organization and specifically family photos. When my parents were preparing to move, I found a bag full of old “film” in one of the boxes. I took the film in to a processing lab, but all of the film was damaged and we were unable to have it processed and printed. I am not sure if my lack of childhood memories is due to the absence of pictures or not, but I certainly feel that a photo captures a moment and provides an anchor that helps to engrave that memory in our hearts and minds. My parents loved me very much, of that I am certain, but I can honestly say that my memories are random and vague at best. I remember only one birthday. I don’t know how old I was (maybe 12 or 14?) and my only memory is of the cake because it looked so pretty with strawberries carefully sliced on the top of it. I remember coming downstairs late at night one December evening and catching my mom with fabric spread out on the floor making what would later become the quilt I got for Christmas that year. I remember the one doll I got when I was quite small and a clock radio cassette player I received as a young teen. I am grateful for the few photos that I do have, but regret the absence of “proof” from my childhood. I can’t imagine that I didn’t have a birthday party, and yet remember none. So, you can see why for me scrapbooking is more than a hobby, it is something that I deem essential and am passionate about. I want to take those memories and create anchors on which my own children can track the milestones of their lives. I am not perfect, but definitely have the attitude that if you are going to do something, do it with excellence or why bother. So, when I was embarking on this new hobby a few years after Eden was born, I knew that I would need to have a plan in order for me to stay on top of my “scrapbooking” projects. Here is what I do, to keep it fun and less overwhelming. One two page NEWBORN lay-out (both pages when the book is open) This highlights their birth and our time in the hospital, really just the first few days of life. It also includes a few pregnancy photos. One two page layout of 0 to 6 months. One two page layout of 7 to 12 months. One two page layout of their FIRST BIRTHDAY party. One two page layout of them as a ONE year old. One two page layout of their SECOND BIRTHDAY party. One two page layout of them as a TWO year old. The title page from Shay’s album. A sample layout from Eden’s album, capturing her life when she was 4. A sample birthday layout from Shay’s album. This process will continue until they are 18. There are no “events” captured in these books. I reserve it for single snapshots of the milestones, people who are important to them (pictures of them with mom, dad, brother/sister, cousins, aunts, grandparents, special friends, etc.) as well as important events and FIRSTS. So for example, it may contain only one photo of Christmas from that specific year or one photo from a piano recital. The concept of the ONE year lay-outs is to highlight what was important to them at that time in their lives. What I love about this set-up is that I really only have two lay-outs to do per child per year. Four lay-outs that I must commit to in order to stay on top of their books. This helps me to stay motivated and creative without it becoming a daunting task on my “to do” list. Side note: Make sure you journal. Journaling may seem like it is not important, but in order to truly capture the moment it is important to write a little about it. When I look through my older layouts, I can see that I kept journaling to a minimum. I often just included titles and dates on my photos, but over time, I saw the value and began to write more. I sometimes type my journal entries, but often print them myself. Having lost my mom, I know how much a sample of her writing on an old recipe means to me. Including your own writing is like signing it “made with love, by my own hands just for you”. I just really feel that journaling is important and needs to be included. 2. I have created one 12″ X 12″ album that is solely for Christmas. I have a title page at the front of the book and then do one two page lay-out per year. I love this book because it captures the people most important in our lives and shows how everyone has grown and changed over the course of a year. Again, one lay-out per year is very manageable for me. The title page of our Christmas Album. A sample layout from our Christmas Album. 3. When the kids started school, I also began a school album. I actually have both kids in the same album. Basically, I do a two page lay-out for every grade they are in. The photos include field trips, their teachers, concerts, assembly performances, awards, etc. I am not sure if I will continue this after grade 6 or not. I may just restrict it to memories from their elementary school days. This adds two more lay-outs to the list, making it a total of SEVEN lay-outs that I am absolutely committed to staying on top of. Luckily, the kids’ birthdays are six months apart, so it isn’t too difficult for me to pull this off. This is a sample layout from the kid’s School Album. 4. In addition to the above, I do have a few other albums that I putter at. I consider them “extras” and do them just for fun. Special Events album – I have only one album that I use to capture entire events. For me, this is just too much to commit to. I have a list of lay-outs that I think would be fun to do ~ some day. I don’t worry about these and only do them when I feel inspired. School Album – I think I figured out that I have now taught well over 700 children in my years as a teacher. A few years ago, I pulled together a very simple album with my staff and class pictures from over the years. This is pretty easy to keep current as there are very few photos to add and the embellishments are kept very simple. This is a sample from my special events album. 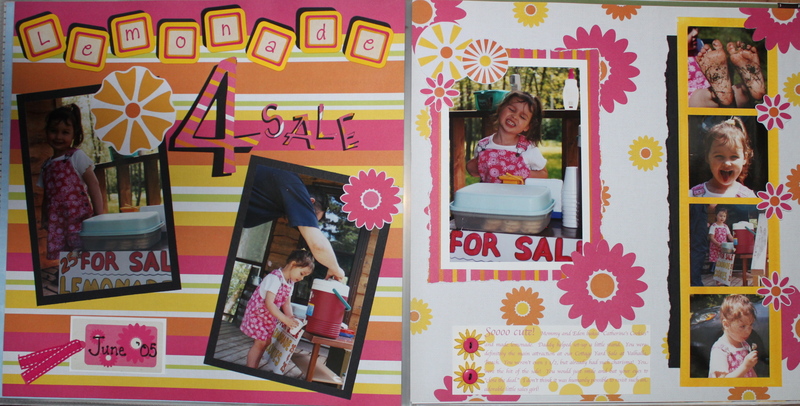 This layout features Eden’s First Lemonade Stand! I know so many scrapbookers that try to do it all! They try to scrapbook every thing. This just doesn’t work for me. I am too busy and too much of a perfectionist. I would constantly feel like I was behind and this would totally block my creativity and remove the fun. I really enjoy scrapbooking, but never want it to become so overwhelming that I resent it or the time that it requires. My best advice is keep it simple and manageable. One more tip ~ don’t scrapbook family vacations. We are so fortunately that we can drag our photos into photo books and order very professional looking photo books with a few clicks of the mouse. For family vacations or big events, go with the online photo book option. I love that I can journal right in the book and have the whole trip captured within a few hours. The books are generally well made and you can even order multiple copies, if so desired. Posted on October 26, 2013 by Cindy Roy •	This entry was posted in Family, Scrapbooking and tagged capturing family memories, do's and don'ts of scrapbooking, getting started scrapbooking, how to scrapbook effectively, how to start scrapbooking, managing scrapbooking, scrapbooking, scrapbooking pitfalls, setting up scrapbooking albums, what to scrapbook. Bookmark the permalink.